Be the first to share your favorite memory, photo or story of Leora. This memorial page is dedicated for family, friends and future generations to celebrate the life of their loved one. Leora M. Glogowski, 86, of Momence, IL died on Friday, January 18, 2019, at St. Joseph Hospital in Highland, IL. She was born on December 29, 1932, in Momence, IL, the daughter of Elof and Gladys Ward Peterson. She married Robert C. Glogowski on September 14, 1951, in Momence, IL. He preceded her in death on December 14, 1993. She is survived by two daughters and sons-in-law; Marlene and Larry O’Brien of Stevensville, MI, and Deb and Marion Asher of Highland, IL. Five grandchildren: Corey (Pilar) O’Brien, Katey (Jonathan) Martinek, Marc (Heidi) Sikma, Breanne (Brian) McBride and Jenee (Nathan) Mackiewicz and eleven great grandchildren. One sister-in-law; Pauline Peterson of Momence, IL. She was preceded in death by her parents and one brother, Elwyn Peterson. She was a member of the St. Patrick Catholic Church in Momence, IL and member of the Council of Catholic Women. 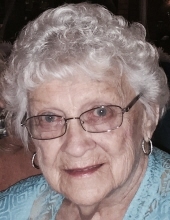 She enjoyed spending time with friends (especially playing Pinochle), shopping for bargains, taking trips to casinos, jigsaw puzzles and enjoying her family. To send flowers or a remembrance gift to the family of Leora M. Glogowski, please visit our Tribute Store. "Email Address" would like to share the life celebration of Leora M. Glogowski. Click on the "link" to go to share a favorite memory or leave a condolence message for the family.